Whilst this was happening there were plenty of jobs to be on with. 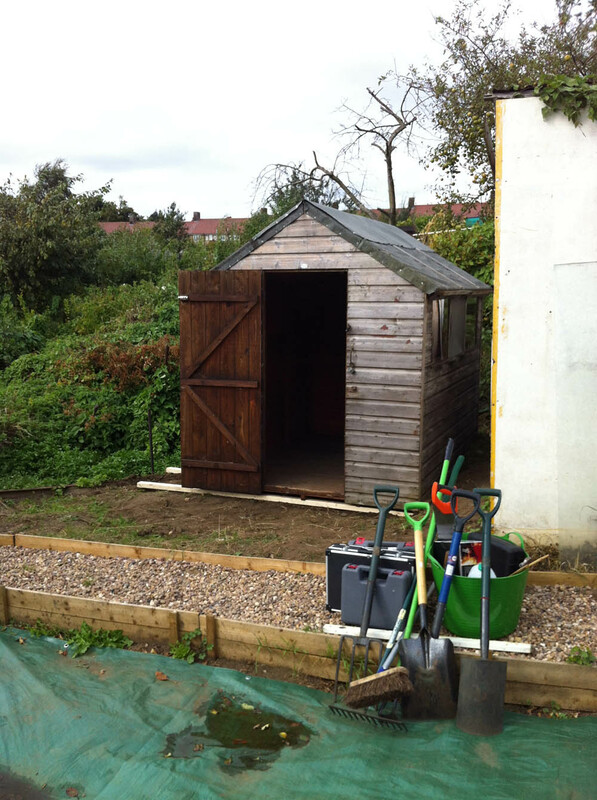 For instance, I put up a second hand shed (with a lot of help from my Dad) that I had acquired from a friend and set up some shelving for my seeds to grow (when the weather improved). 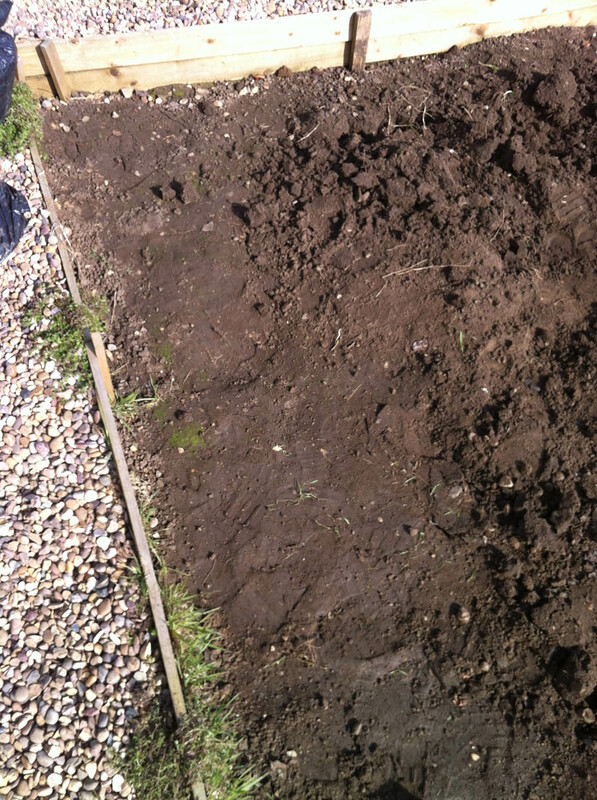 As soon as the ground was soft enough (sort of) for me to dig it, I did. I attacked the remaining roots and weeds with a vengeance. I was determined for the weeds to lose. I was going to win. It was, to say the least, tiring and full of frustration. The ground was so compressed it took brute force just to slip the fork into the soil, let alone dig any of the plot over. I divided the plot into four main sections, marked out by leaving paths of the compressed ground. This would allow me to group my crops and establish some spaces for crop rotation in the years to come. I first dug the biggest of the plots over as this was the area I wanted for my potatoes and I was acutely aware of the need to plant these ASAP! I was left, unsupervised, to visit the local garden center and proceeded to purchase what I considered a suitable amount of potatoes. Needless to say I perhaps may have ended up with a few more than I needed. 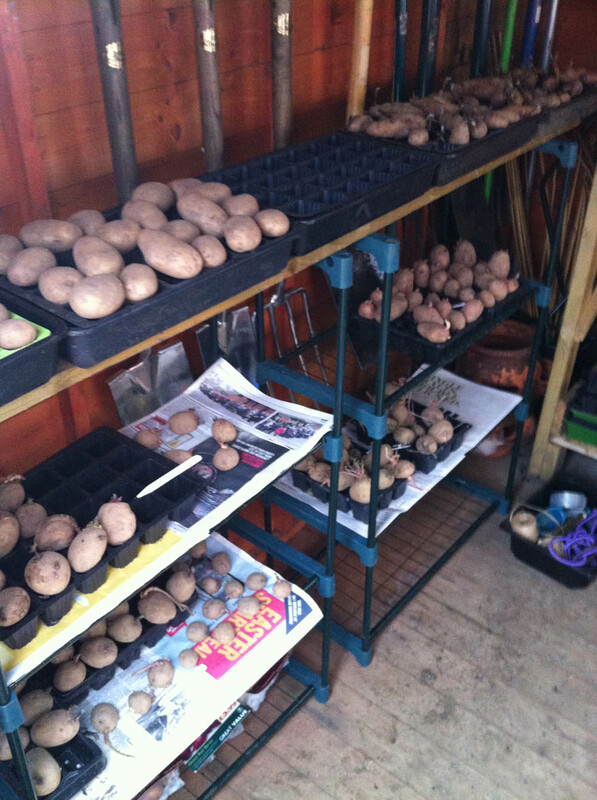 In March 2013 I started (a bit late) to chit some potatoes – These are a small selection of them. I had completely over-bought and had enough to fill the entire allotment twice. 240 seed potatoes would provide approximately 2000 potatoes!! I had to give some (alot) away! I had fallen foul of a buy-one-get-one free offer on bags of seed potatoes. This meant I had come away with ten bags of potatoes – totaling approximately 240 seed potatoes. I dismissed initial ribbing about the quantity being too much. It was only then, when I arrived at the allotment I realised my error. Each potato needed a spacing of about 1 metre between then, with 1.5 metres between rows. 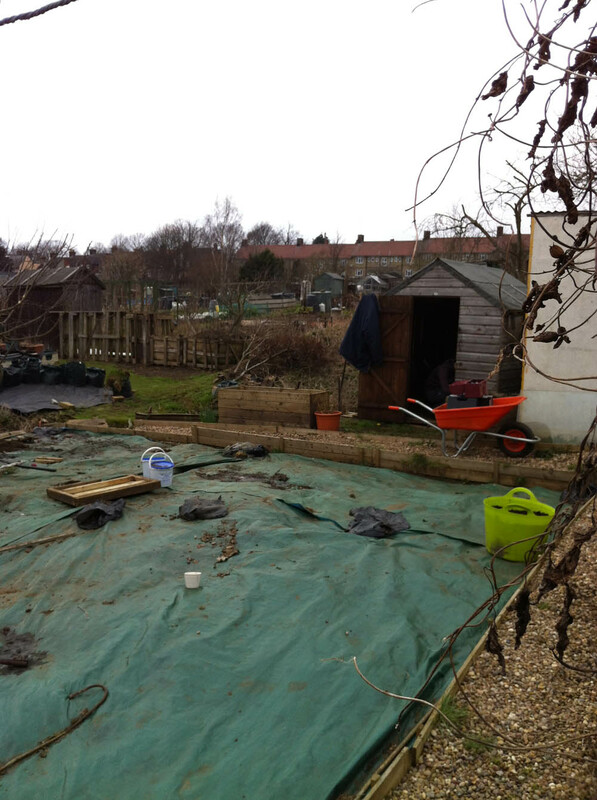 I had an area of 10m x 12m in total on the main section of the allotment. If I planted every potato I would have filled the entire main section, the other weed covered section (12m x 6m) and still have too many. What was I going to do with 240 seed potatoes that were currently chitting in my shed? I had to give away a considerable number of seed potatoes – dealing them out to people from the back of the car in the work car park certainly raised a few eyebrows. Needless to say, this slight mishap will live with me at every meal involving potatoes – it has so far at least. This entry was posted in Allotment and tagged allotment, allotment advice, allotment mistakes, allotment tips, compacted soil, crop rotation, dealing potatoes from the car, dividing up allotment, donating potatoes, free shed, funny looks, garden advice, garden centre, gardening, gardening tips, more weeds, never allowed to forget it, not to be left alone, potatoes, rotation of crops, shed, tarpaulin, too many potatoes, unsupervised, weed control. Bookmark the permalink.